Maybe you've heard of Arkham Horror or Mansions of Madness. Maybe you've heard of Elder Sign (but probably not from Talking Time). Maybe you haven't heard of any of those. 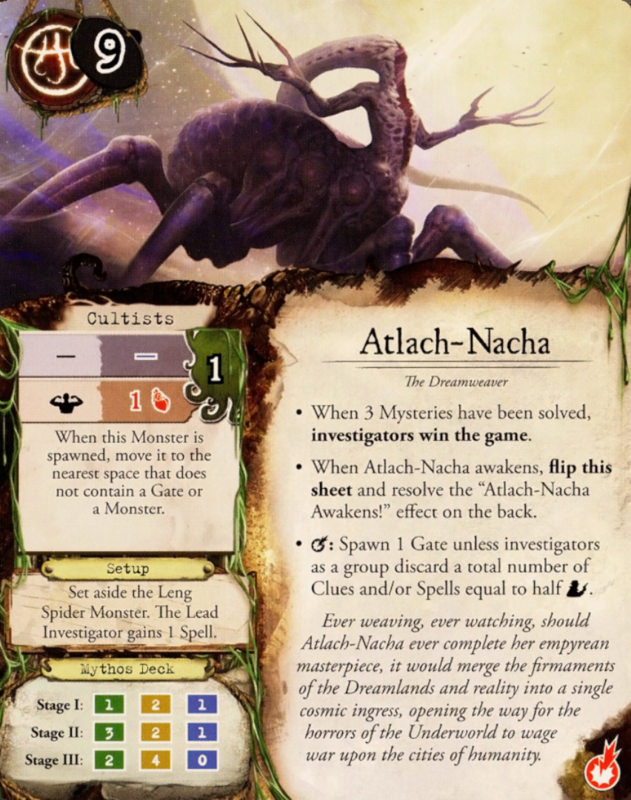 The point is, Fantasy Flight Games has made a living off of the Cthulhu mythos. Eldritch Horror, on the other hand, takes the conflict to a global scale but also streamlines many of the mechanics of its predecessor. Eldritch Horror is a faster game, and it's also much easier to explain and play (which doesn't necessarily make it easier to win). 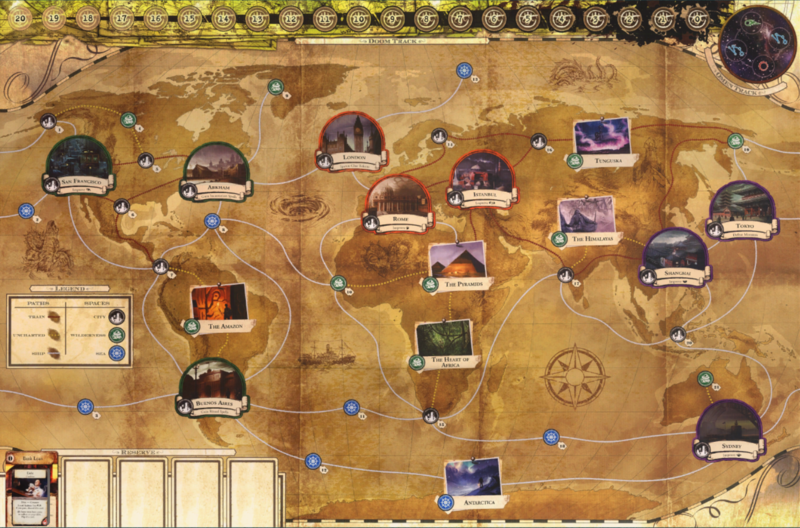 Aside from its map, the premise in Eldritch Horror is identical to Arkham's. A group of investigators is still attempting to prevent some sort of dark horror from rising and destroying the world as we know it. The great news as far as you're concerned is only one person needs to know the finer details of the rules, and that person is me. For example, the game's setup is pretty complicated, but that'll be done before you even start playing. So let's skip to the part that you need to know. The game is divided into three phases: the Action Phase, the Encounter Phase, and the Mythos Phase. Prepare for travel. If you are on a city space, take 1 travel ticket of your choice (train or sea). You can only take a travel ticket for a type of travel that's available from the space you're on, and you can only hold two travel tickets at a time. Actually travel. Move from your current space to a connected space. Then, you may spend any number of travel tickets to move one additional space per ticket. (Of course, you need a train ticket for train tracks and a sea ticket for sea travel.) Remember that you can move one space without any tickets -- you only use the tickets for additional movement. Trade your possessions with another investigator on your space. Your health, sanity, conditions, and improvements aren't possessions. You know this in your heart. Rest. Recover 1 health and 1 sanity. You may rest only if there isn't a monster on your space. Acquire assets. If you are on a city space, test your Influence (see below). You can acquire assets with total value up to the number of successes you rolled. You may acquire assets only if there isn't a monster on your space. Component action. 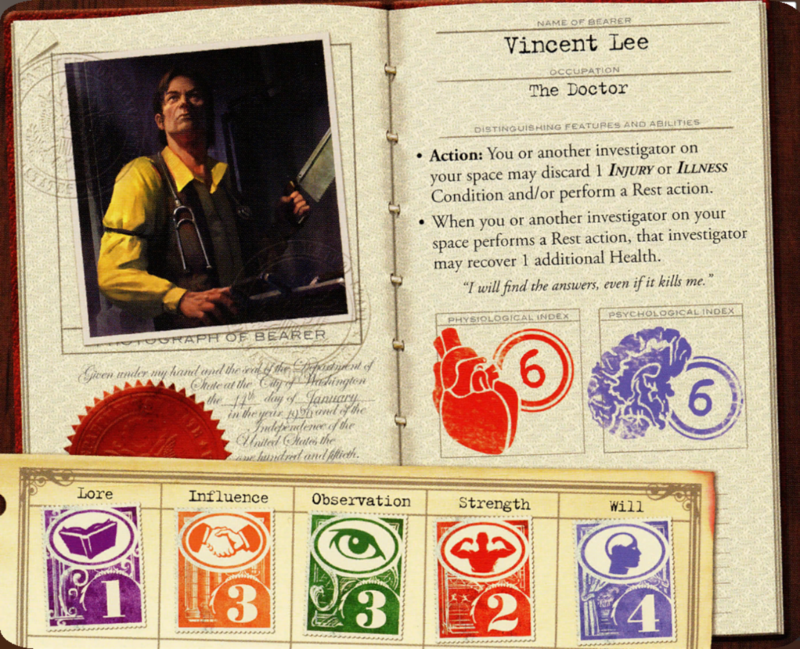 Some cards, including your character card, indicate an "Action" or "Local Action" that you can perform. Unlike the other actions, you can perform two component actions in a single turn, so long as they come from different components. Local Actions on your possessions may be performed by other investigators if they are present with you. Starting with the lead investigator and going clockwise, each investigator resolves an encounter. If there are monsters on your space, you must resolve a single combat encounter against each of them, one at a time, in the order of your choice. If there is an epic monster on your space, you encounter it last. After you resolve all combat encounters, if there are no more monsters in your space, you may resolve another encounter if you wish. If your space has no monsters, you must choose a location encounter or token encounter. Location encounters are specific to your location. If you're on a named city, you'll have a special encounter that won't occur anywhere else. Those cities specialize in providing a certain benefit that you may or may not be able to read on that board -- for example, Tokyo promises to help you defeat monsters, which checks out. If you're not, you will have a general encounter that's particular to the type of location you're at (city, wilderness, sea). You can choose to draw from the general encounter deck even if you're at a named location, although general encounters are generally worse for you. Token encounters are available only when there's a token in your space. 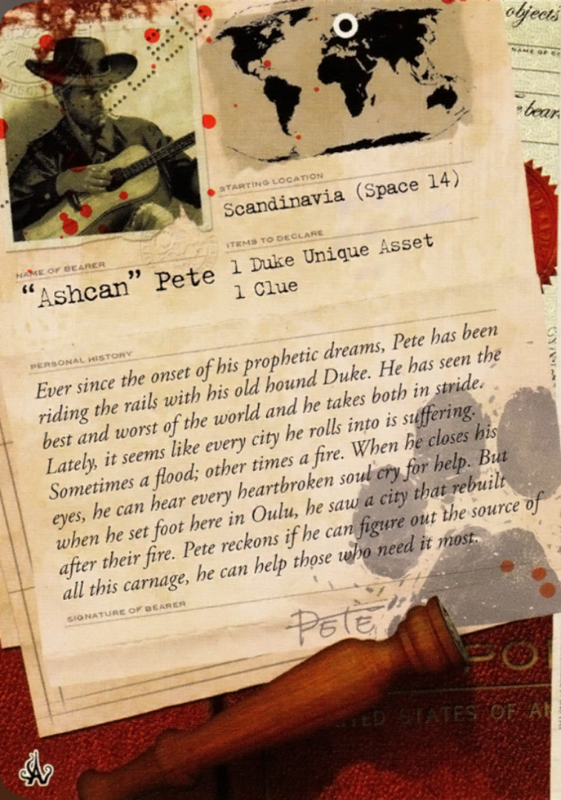 Clue: You may attempt to acquire the clue token by drawing a research encounter card. Gate: You may attempt to close the gate by drawing an other world encounter card. The risks and rewards tend to be a little higher on these, but closing monster-spawning gates is its own reward. Expedition: You may attempt to acquire an artifact by drawing an expedition card. Rumor: You may attempt to counteract a rumor as indicated on the rumor card. Defeated investigator: You may attempt to relieve a deceased investigator of his or her former possessions as indicated on the former investigator's sheet. 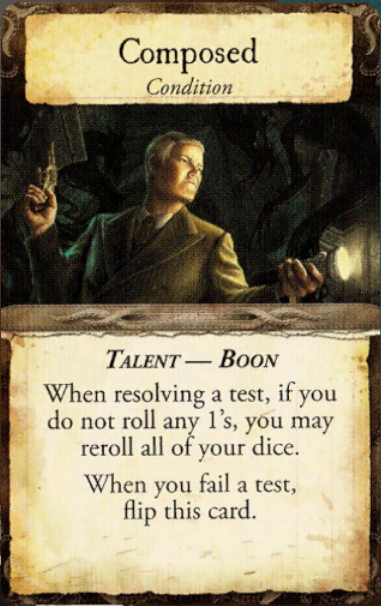 Some cards provide bonuses to skill tests. You can only use one such card per skill test. If you roll at least one success (a 5 or 6), you pass the test. If you roll no successes, you fail. 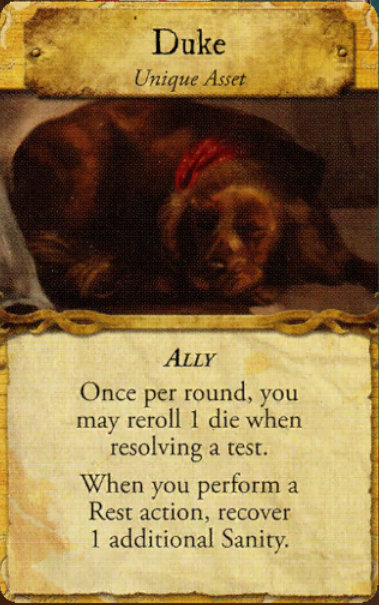 After rolling for a test but before resolving it, you may spend a clue token to reroll a die. You may keep doing this as long as you have clue tokens, but clue tokens are (often? always?) required to complete game objectives. Spend them wisely. Bad things happen! You honestly don't need to worry about this, but in case you're worrying anyway, I've detailed what can go wrong. Advance the omen. The omen token (in the top right of the board -- the token isn't there in the picture above, but the omen track is) moves clockwise to the next space. Then, for each open gate with a symbol matching the new omen, the doom token advances one space towards zero. When doom reaches zero, the ancient one awakens, and things get a lot worse for everybody. Spawn gates. Take the top token from the gate stack and place it on the space indicated. Then, spawn a monster on that space. The number of gates spawned depends on the player count. Monster surge. At each gate that matches the current omen, spawn monsters. The number of monsters spawned depends on the player count. If there are no matching gates, spawn a gate instead. Spawn clues. The number of clue tokens spawned -- you guessed it -- depends on the player count. The back side of the clue token tells you where it should go. Place rumor token. 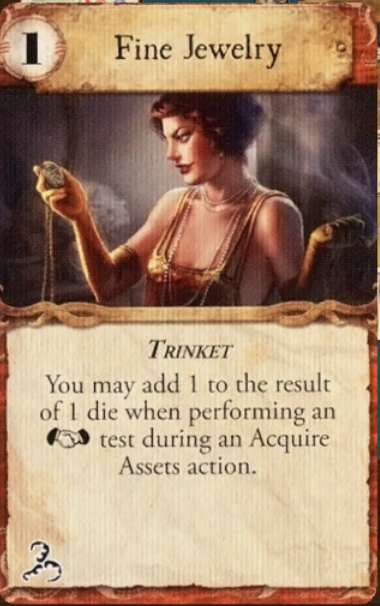 If the mythos card is a rumor, place a rumor token on the indicated space to remind you where to go to resolve the rumor. Rumors are persistent bad effects, some of which just straight-up lose the game for you. At the end of the mythos phase, the lead investigator chooses who will be the lead investigator for the next round (with the option of keeping it). 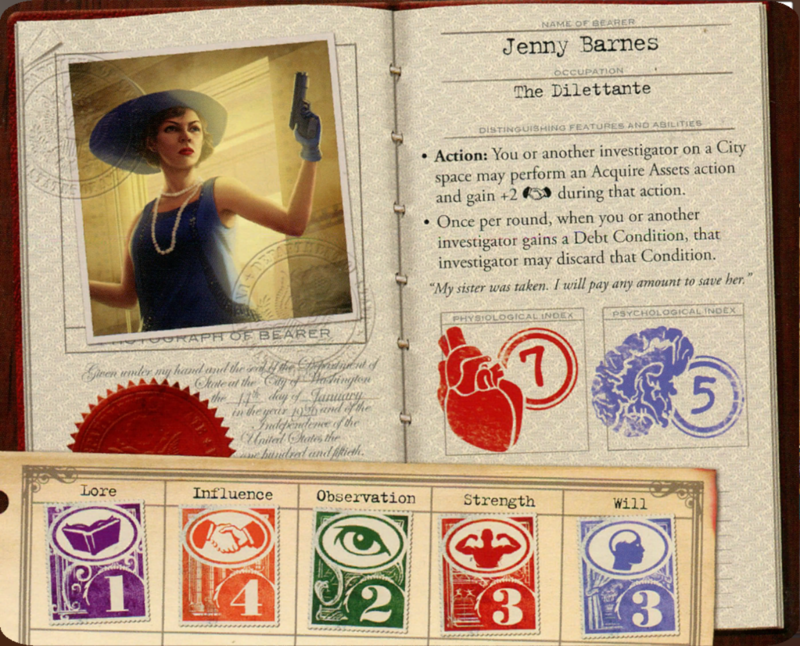 The goal of the game is to solve three mysteries before the ancient one awakens. Do that, and you win! Oh, yep, there are lots of ways to lose. If the ancient one wakes up, it will introduce a loss condition. If an investigator dies while the ancient one is asleep, no problem -- get a new one. If an investigator dies while the ancient one is awake? Problem. Do not get a new one. If every investigator is dead, yeah, that's a loss. Rarely, a card will cause you to lose the game outright. Usually, it's gonna be a rumor that does this to you. If the mythos deck is empty and you need to draw a mythos card, yeah, that also makes you lose. But I wouldn't worry about it. You got this. Just, you know, say you wanna play. The game can take up to six players. Do we want six players? I dunno. If we don't get enough players, I'll play. OK. I will probably accommodate you. 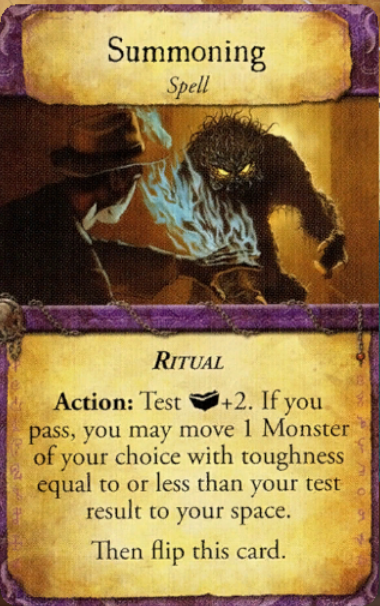 We aren't playing with expansion mechanics, but we do have access to expansion investigators, and I'll be pulling from the pool of investigators that don't specifically interact with expansion stuff. I think I played the last time we did this (I vaguely recall going insane and clocking Mogri upside the head) but I'm definitely down again. 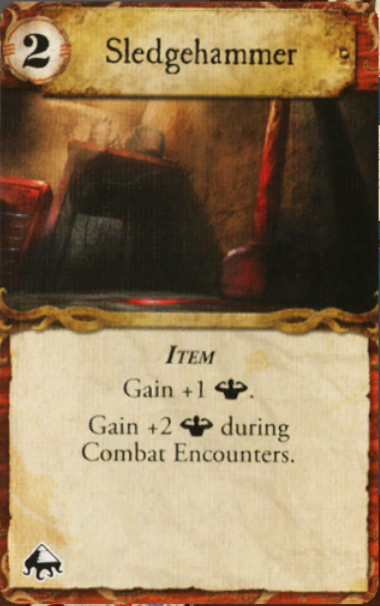 Maybe you've heard of Elder Sign (but probably not from Talking Time). I wanna like Elder Sign but it's just so swingy and prone to screwing you up at the last minute. This sounds vaguely familiar, but I can't for the life of me remember what game it was. 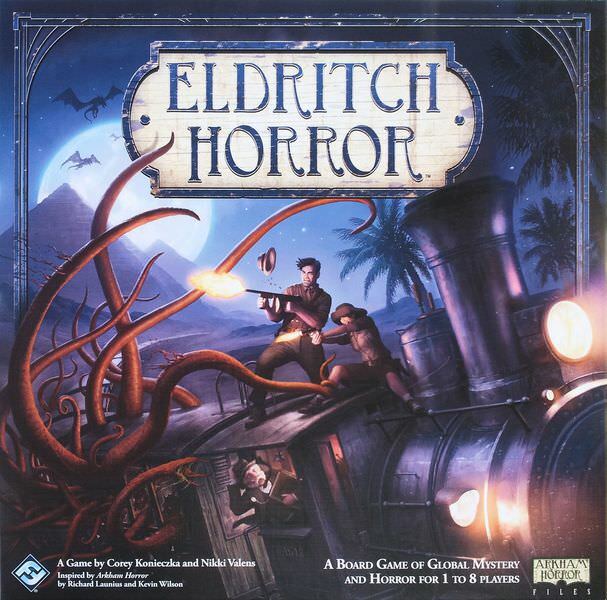 I can tell you it wasn't Eldritch Horror, because I haven't played Eldritch Horror. My dirty little secret: half the time I run a board game here, it's research to figure out if I want to buy it. 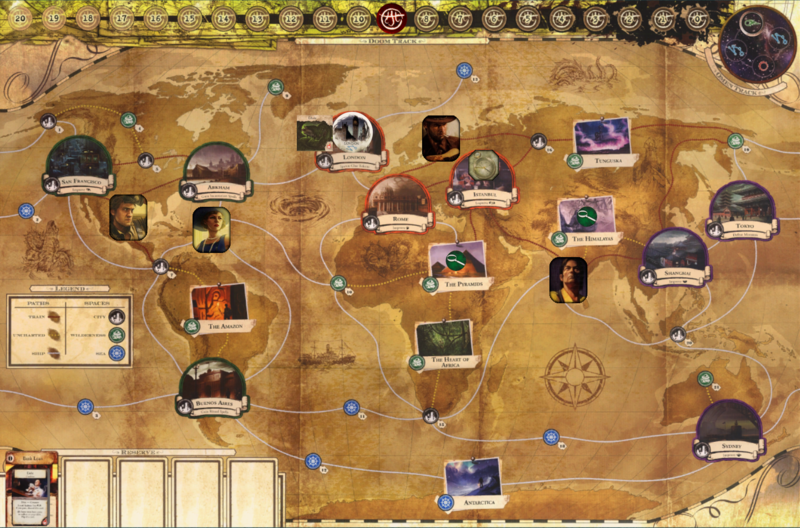 I think I've played half a game of Elder Sign (and on the app, at that). It clearly didn't make much of an impression! Stingray Almonds and then maybe Sarcasmorator used to run Arkham Horror games on here so maybe you remember those? The Aesthetic is the same for all these games. EDIT: or we actually have played this too. At least I got right who was running the game. Glad to see Cthulhu is getting a head start by Mandela effecting all our potential investigators. Turtle should be popping in shortly to say the first game was run before he was born. I'll play! Never played one of these cthulu things before. Oh hey, Eldritch Horror! I’ve heard of that game and always wanted to try it. May I play? Everyone is going to start this game with a sanity penalty. That dimension must have gotten devoured, I think. Hi! If there's room left, I'll take a slot! The game hasn't started yet and this is already my favourite board game LP. I'm surprised that no one played it on here before! I was really hoping to get someone who'd played the game before... but I guess you'll do. 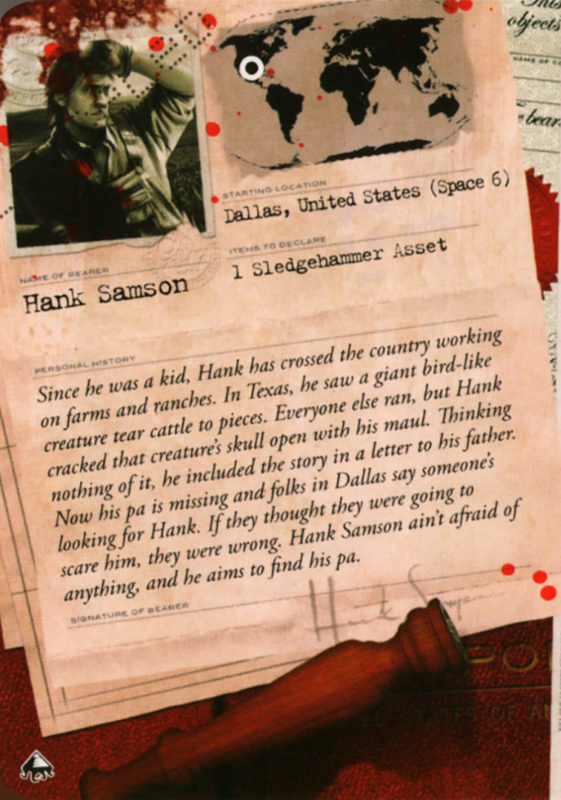 Hank is our starting lead investigator today. This will matter in a second. For now, let's look at the blunt object he's hauling around. A persistent +1 Strength just for carrying it around, and you can swing it at bad things to add +2! 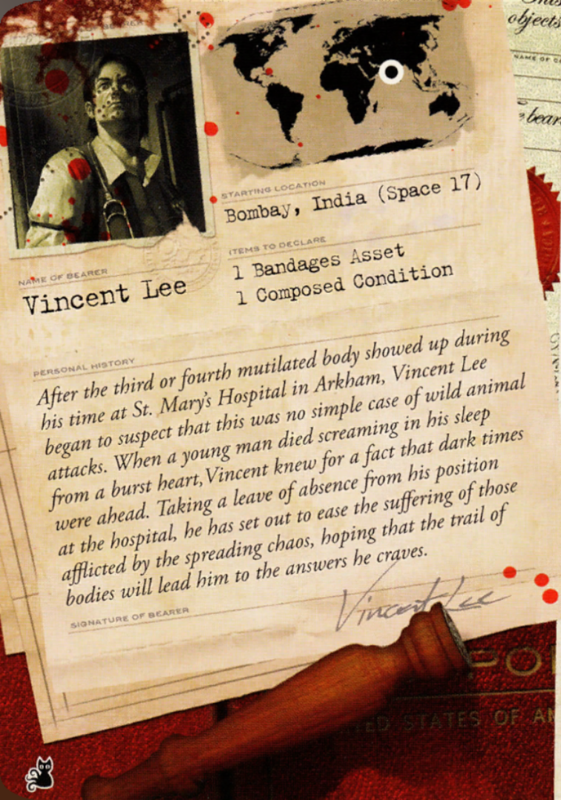 Vincent Lee is really good at curing himself and his friends! That should come in handy. Vincent maintains intense concentration, as any good surgeon must. Cash oozing out of every pore, Jenny will buy her way to victory. Like, she's seriously good at buying things. 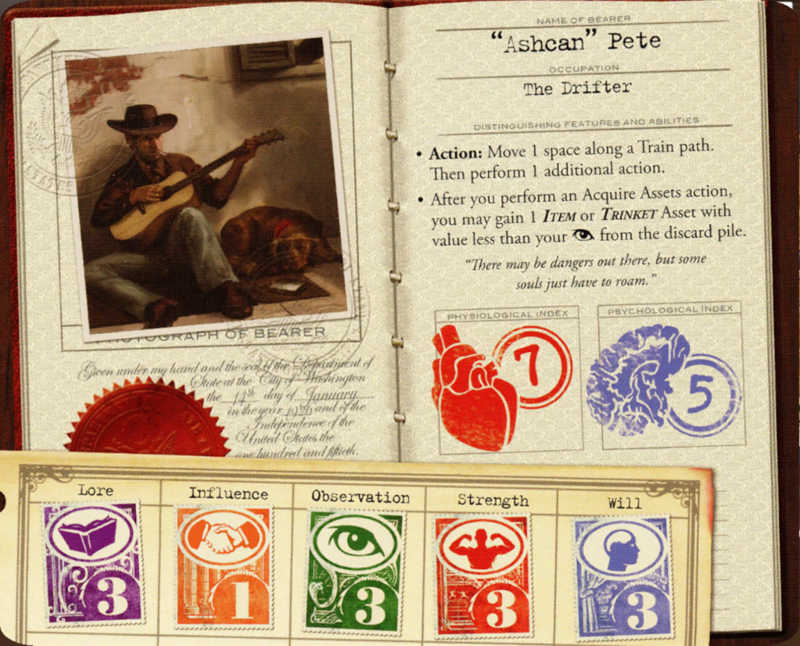 Pete was born a wanderin' man. He is accompanied by a Good Boy. Man, I'm hungry. Who wants to go for some Atlach-Nachos? 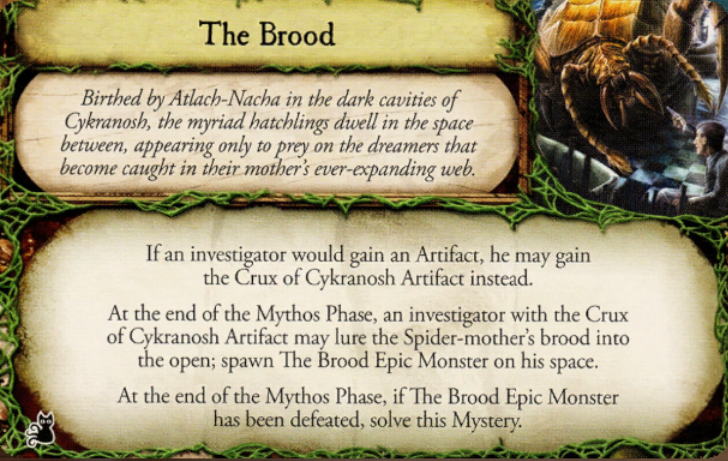 As the setup instructions dictate, we'll set aside the Leng Spiders (there are two, so if it only wanted me to set aside one, it should've said so) and give the lead investigator a spell. Hank is the "lucky" recipient. I've already won the game, I got Duke! A gate spawns in London, bringing with it a Dhole. This is qualitatively very different from an A-hole. It's got a Reckoning effect that will do unpleasant things if you leave it alone. The gate has the blue omen symbol that shows up on the omen track twice as often as the other two. ...your starting mystery tasks you with the acquisition of a certain Artifact. To that end, you may be interested to know that our first expedition will take place in Istanbul. Here's our starting Reserve. 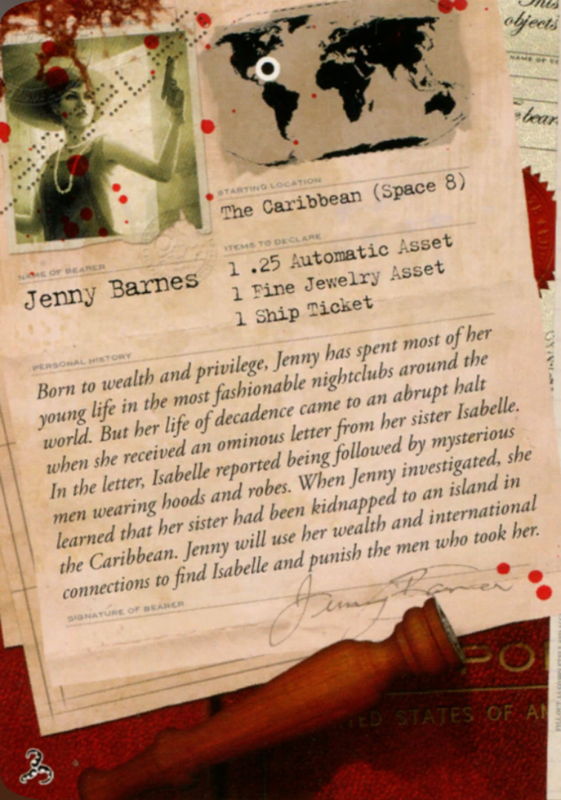 Investigators, such as Jenny, can use the Acquire Assets action to buy these. Note the Bank Loan option, which adds two successes in exchange for a Debt condition. Debt does bad things come Reckoning, but you can test Influence as an action in order to attempt to get rid of it. More about that Dhole: it is a very tough monster. To fight it, you will test Will -1, hoping to prevent 3 Sanity damage, and then you will test Strength -2, hoping to prevent 3 Health damage. You need 5 hits to kill it. That's bad! I'll go into more detail on how combat works later on (or you can check the old Eldritch Horror LP for details right now). 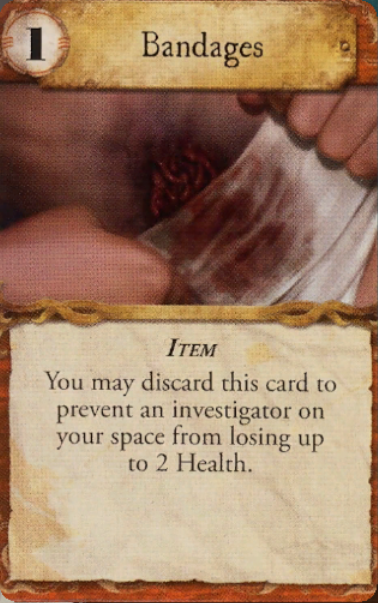 On Reckoning, the Dhole moves 1 space toward the nearest investigator, then every investigator on or adjacent to it loses 1 Health and 1 Sanity. That's... not so bad. It means it will someday leave London, allowing you to close the gate more easily. Let's have some actions! The current player order is Hank, Vincent, Jenny, then Pete, which matters for Acquire Assets but not much else. Purchased assets are replaced immediately. Last edited by Mogri; 09-24-2018 at 02:53 PM. Remind me what that token on Istanbul does? Trying to decide which way to head. Makes the most sense that I hang out near other folks, I’d reckon. edit: expedition, duh, you said that. I’ll travel to Istanbul. Then attempt to acquire assets. Go big or go home, let’s do the expedition after that. Last edited by jpfriction; 09-22-2018 at 09:39 AM. It's a little bit risky with how close that monster is, but. For Acquire Assets, since it's in-turn, go ahead and do your own rolling. If you're using your investigator's special action (and there's little reason not to), you'll roll 6d6 and count any fives or sixes as successes. Then, because you're wearing some very Fine Jewelry, you can count a single four, too. I would like to point out that this is over twice as much Asset Acquisition as the next most capable investigator. Of course, Hank and Vincent have first dibs on the Reserve this round. I don't think there's anything truly, ridiculously good for sale this time, but then there never will be if no one clears these out. Gonna have to figure my move out tonight, sorry. Rolled (2,1,2) so not buying anything today. Unless you take a bank loan. Jenny lets one player take a free loan each round. I don't think there's anything truly, ridiculously good for sale this time, but then there never will be if no one clears these out. 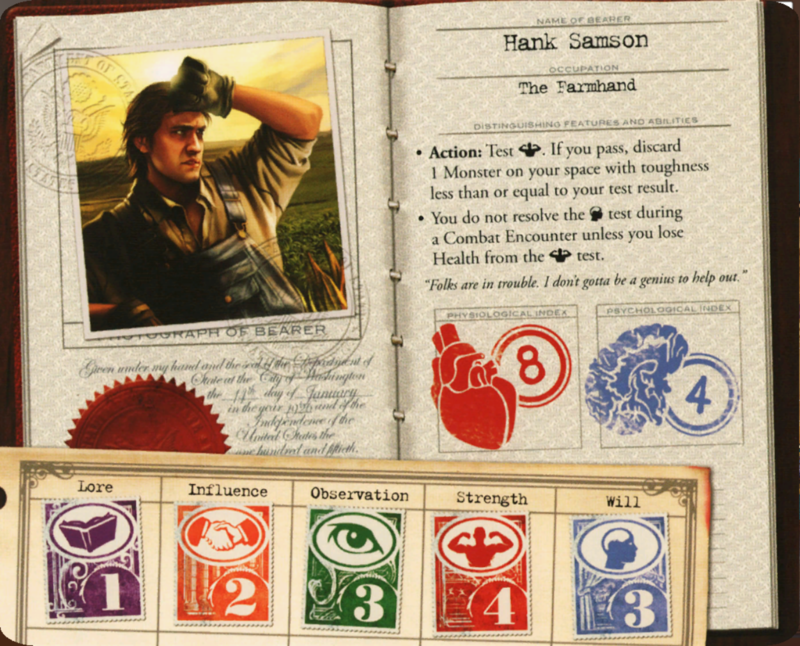 I have never played this game before so I don't really have a good frame of reference but are you saying that there are better cards than the tommy gun and talisman? No thanks. Wouldn’t get me enough to get the good stuff anyway. I'll move to San Fran and acquire assets. Rolled 3,5; I'll take the charter flight to Tokyo. Thomas and the Talisman are pretty good, but there are better! The Double-Barreled Shotgun, for example, is also +4 strength in combat, but it counts sixes as two successes. The Flamethrower is +5 strength, and it reduces damage you take from monsters by 1. 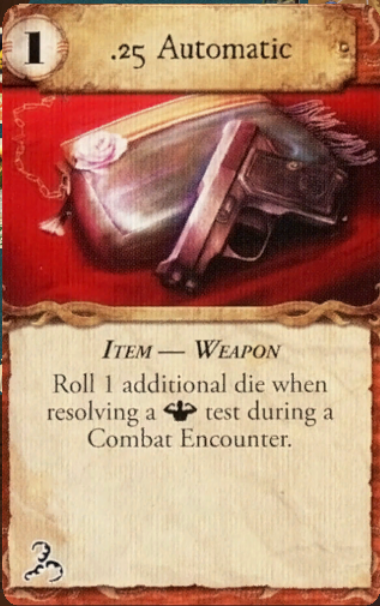 And that's just weapons -- since you can only use a single modifier in each test, you might prefer something like one of the many allies that give you +1 to two stats and allow you to reroll 1 die when resolving tests in those stats. Hank books a flight to Tokyo. Our new asset is an ally: the Witch Doctor. He costs 3, and if you acquire him, "Investigators on your space may recover 1 additional Health or discard a Curse when performing a Rest action." This stacks with Vincent's passive ability. Jenny, since no one bothered picking up a loan, you can take one and immediately discard it. That's two immediate successes on top of whatever you can squeeze from six dice. The Dhole has 5 toughness, so Police Assistance won't help, but you can still buy it to make room for other stuff.